Seventy-one years ago today, Japanese fighter planes attacked the U.S. naval base at Pearl Harbor. The assault claimed the lives of more than 2,500 people, nearly half of whom died on the naval battleship USS Arizona, which exploded and sank after it was hit four times by Japanese bombers. The wreck still lies at the bottom of Pearl Harbor. 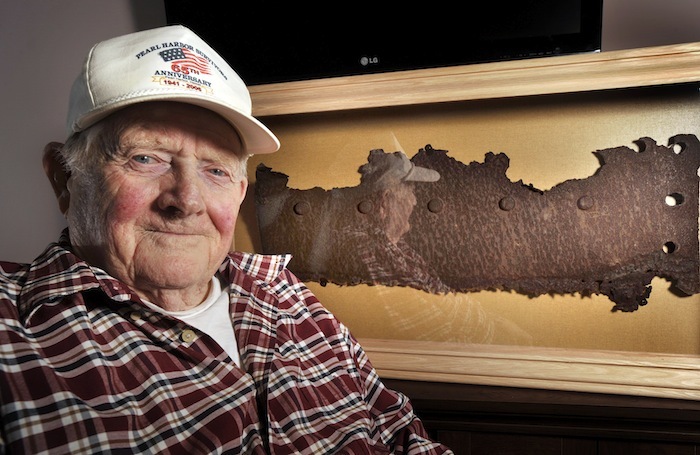 At 1 p.m. today, the time in Maine when the Japanese attacked, a small section of the ship’s deck house superstructure will be unveiled at the Maine Veterans’ Home in South Paris. It’s not much to look at — a rusted and bent piece of metal 32 inches long and 14 inches wide. Several welded rivets are visible. But the relic is a symbol of the sacrifice of the 1,177 crewmen killed that day, including 23 sets of brothers and all 22 members of the ship’s band. Residents at the home and veterans in the area will commemorate the attack by signing the National Anthem, and members of the Western Maine Veterans Advisory will serve as color guard. Sections of the ship’s boat deck were removed in 1961 to allow for the construction of the memorial, said Daniel Martinez, chief historian at the USS Arizona Memorial in Honolulu. The sections were dumped on Navy property on Waipio Peninsula, Oahu, Hawaii, where they remained forgotten and undisturbed for years. In 1992, through an Act of Congress, pieces of the rusting Arizona superstructure were released to qualified organizations. Many of them went to museums, such as the National Museum of the Pacific War in Fredericksburg, Md. The staff at the Maine Veterans’ Home in South Paris asked the staff at the office of U.S. Sen. Olympia Snowe, R-Maine, to help obtain a section of USS Arizona. The staff historian at Navy Region Hawaii encouraged him to approve their proposal quickly. Snowe, in a statement, said she is “incredibly pleased” that the relic is now at the veterans home. “It is certainly fitting that South Paris is now home to this piece of American history, honoring all who lost their lives aboard the USS Arizona on December 7, 1941,” she said. Dutton said in seeking the relic, the veterans’ home made its case by saying veterans could bring it to schools throughout the region and tell the story of what happened on that day.